A 40-year old male presents with severe fatigue and occasional breathlessness on exertion with unintentional weight loss for the past few months. He lost 15 kg (33.0 lbs) over the past 3-months. He adds that he recently developed early satiety with occasional nausea and vomiting. Past medical history is insignificant. He is a smoker for the past 20 years with about half a pack of cigarettes every day. His temperature is 98.6° F (37° C), respirations are 15/min, pulse is 67/min and blood pressure is 122/98 mm Hg. Physical examination reveals conjunctival pallor, an ill-defined mass in the epigastrium and hepatomegaly. Routine laboratory studies show a hemoglobin level of 7.2 g/dL. 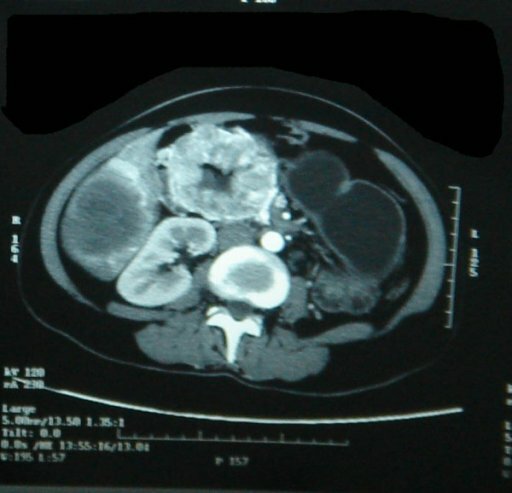 The patient is suspected to have chronic gastrointestinal bleeding lesion. A CT scan of the abdomen is ordered and the image is given. Which of the following structures will be most helpful in classifying the type of bleeding in this patient? A 53-year-old businessman is rushed to the emergency room with a complaint of sudden onset severe crushing central chest pain radiating to his left arm and jaw for the past 2 hours. He has a history of episodic chest pain on exertion for which he uses glyceryl trinitrate sublingually but today his medication did not relieve the pain. His vitals are stable and physical examination is within normal limits. An electrocardiogram showed ST-segment elevation in leads II, III, and aVF. Blood is drawn and sent to the lab which is positive for cardiac troponins. A diagnosis of acute inferior myocardial infarction is made the patient is sent to the catheterization lab for an angioplasty with stent placement. The coronary catheterization will most likely reveal blockage of which of the following arteries? A 58-year-old department store manager comes to his doctor’s office complaining that he had recently been waking up in the middle of the night with abdominal pain. This has happened several nights a week in the past month. He has also been experiencing occasional discomfort in the afternoon. The patient's appetite has suffered as a result of the pain he was experiencing. His clothes hang around him loosely. The patient does not take any prescription or over the counter medications. The remaining of the patient’s history and physical exam is completely normal. The doctor refers the patient to a gastroenterologist for a stomach acid test and an upper gastrointestinal endoscopy which reveal that this patient is a heavy acid producer and has a gastric peptic ulcer. This ulcer is likely found in which part of the stomach? A 54-year-old patient is brought to the emergency department due to palpitations, lightheadedness and weakness. He says he had been consumed more alcohol on the previous day on his wife’s birthday. Past medical history includes arterial hypertension, to which he regularly takes enalapril. On examination, an irregular pulse is palpated on his radial artery and the patient is ill-looking. An electrocardiogram is performed and is presented in the picture. The physician explains to the patient that he will be started on an anticoagulation therapy to avoid complications. In which of the following locations is a thrombus most likely to be formed? A 16-year-old teenage patient comes to the clinic complaining of episodes of sharp pain in her left upper limb. The pain started gradually a few months ago and has become progressively worse, especially after physical activity. She describes her pain as “someone stabbing me in my arm and then the pain moves down to my hand”. She is also complaining of some vision problems in her left eye. Her vital signs are normal. On physical exam she is normal in posture and her appearance is appropriate with her age. Both of her upper limbs are symmetrical. Palpation of her left upper limb shows tenderness mainly near hear neck. A mild ptosis is noticed on her left eyelid with anisocoria of her left pupil measuring 1 mm smaller than the right pupil. The right upper limb is normal. An X-ray and an MRI are ordered (shown in the exhibit). Which of the following is the expected neurological symptoms that this patient will mostly have in her left hand? A 17-year-old girl grabs her chest and collapses on the ground while playing volleyball at her school’s court. A nurse who was present at the site rushes towards the girl to evaluate the situation and realizes that she has no pulse and isn’t breathing. Chest compressions are started immediately and an automated external defibrillator (AED) is brought to the scene within three minutes. A shock is advised and delivered. The patient recovers and attains a regular sinus rhythm and regains consciousness. The patient was rushed to the emergency room. Her pulse in the ER is 65/min and regular, and her blood pressure is 122/77 mm Hg. ECG shows a shortened PR interval, a wide QRS complex, a delta wave and an inverted T wave. Which of the following is the most likely pathology in the conduction system of this patient's heart? 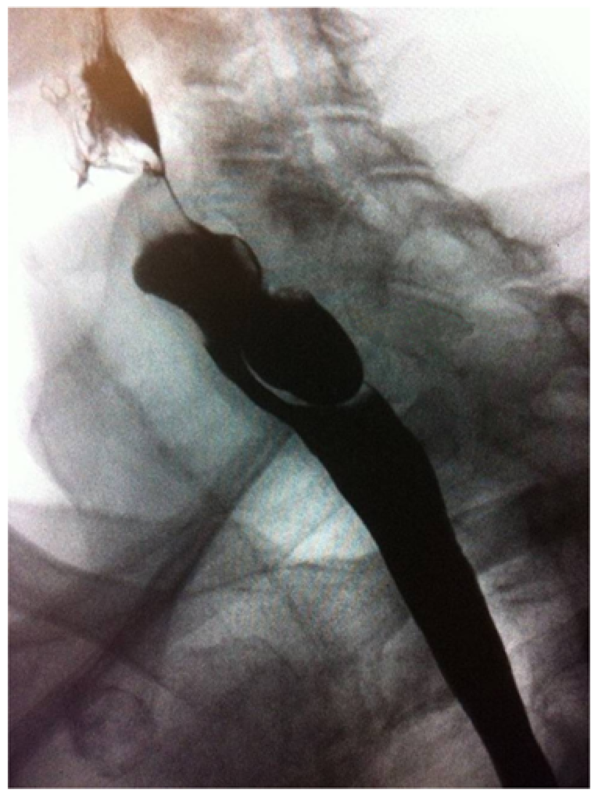 A 75-year-old male presents with dysphagia that started with solids over 1 year ago. He has recently also started to have difficulty swallowing fluids. The patient states he has no difficulty initiating swallowing but sometimes feels like food is getting stuck in his throat. He does not have odynophagia, but has noticed some weight loss. He gives no history of dysphonia, nasal regurgitation or dysarthria. His musculoskeletal system is free of arthritis and skin rashes. His family history is unremarkable for relevant conditions. During examination the patient appears ill, wasted, slightly pale, but neither jaundiced nor cyanosed. Physical examination of his chest, abdomen, cardiovascular system and nervous system appears normal. You order a swallowing study and observe a small outpouching in the posterior neck (see image). What nerve is most likely involved in this patient's symptoms?